Optical Signal Trader introduces itself as a fully automated binary trading software that makes $3,000 a day, but can it be trusted? Is Optical Signal Trader a scam? Just 2 days ago, my readers revealed that they have lost between $250 to $500 each to the trading software, and it prompted me to launch a detailed investigation into the system. Check out my findings in this Optical Signal Trader review. 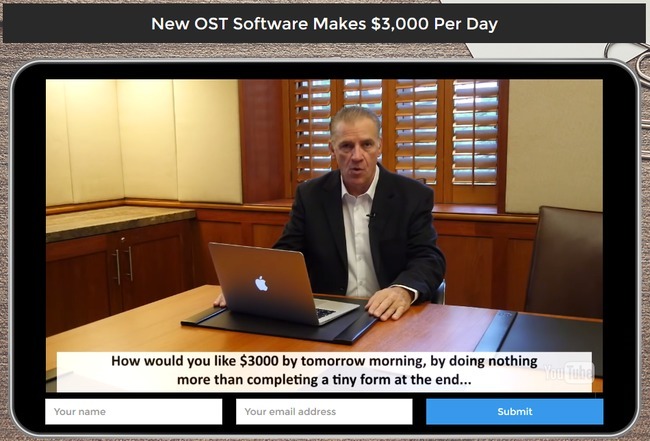 The alleged founder of Optical Signal Trader, Dominic Shepherd claims that his software makes a guaranteed $3,000 a day from the options market, thanks to the advanced technology used in his system. You would imagine paying a hefty sum for a miracle software like this, but Dominic surprised everyone when he revealed that the software is completely free. This is a MAJOR red flag that you should take note. Online scams, or any scam in general make an irresistible offer to lure their victims into signing up. Another reader of mine reported a similar experience, where she sustained a trading loss of $150 in just 1 day. Her trading account went from $250 to $103 within 24 hours. In this case, my advice is to stop trading immediately and request for a refund. Salvage what’s left of your trading fund. Don’t hang on to it thinking it will eventually make you money, because it won’t. Did you ever wonder if these websites really endorsed the autotrader? I’ve seen many cases where push button software scams use reputable financial websites to promote themselves. Recent examples are AlgoMaster app and Terabit Trader system, where they claim to have been endorsed by financial sites such as CNN and WSJ, much like what Optical Signal Trader is doing with their software. Upon investigation, it has been proven that these financial websites have never mentioned any of these binary options software, much less endorsing them. In fact, binary options is so risky that Forbes wrote an article to warn us against gambling with binary options. 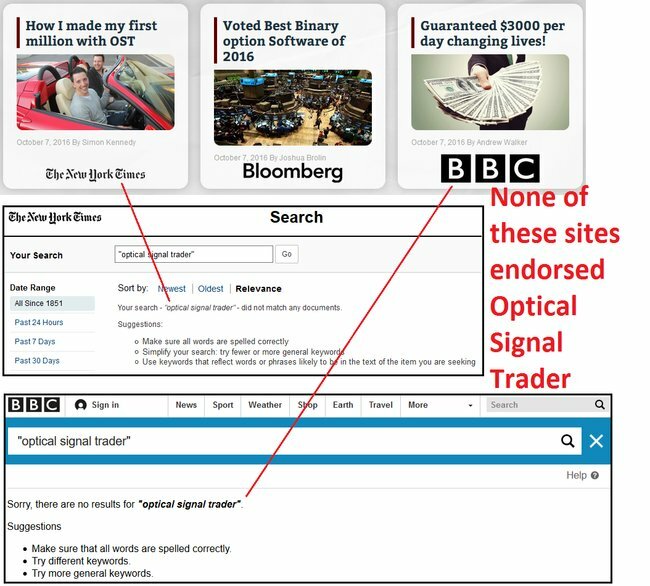 It is clear that none of these websites has mentioned nor endorsed Optical Signal Trader, unlike what is quoted by the scam. Apparently, the scammers behind this software fabricated the quotes and abuse the names of these reputable financial websites to appear legitimate. If you want to conduct your own research and verify my findings, follow these links to the search result pages for these websites: The New York Times, Bloomberg, BBC. If you have traded binary trading software, you would know that the market is closed during the weekends, much like the stock exchange or the Forex market. In other words, you cannot make trades on Saturdays and Sundays since there is no market activity. However, a close observation on the trading table on Optical Signal Trader website showed that the software was still making profits on 1 Oct 2016, which was obviously a SATURDAY. Again, this is not a new scam tactic, but a rather common technique used in binary options scams to deceive inexperienced victims. It was used in a fraud I reviewed recently, called the Gemini 2 trading software. The table was produced using a computer script that matches a series of dates to random currency pairs and profits. There are no real trades behind these profits and numbers. This also explains why real traders who signed up for the software experience heavy losses, because the real performance of the software isn’t as good as what is shown in the “live trades” table. As much as Optical Signal Trader wants to keep you in the dark, they have to reveal the true nature of the scam somewhere within their website. This is to protect themselves from lawsuits and legal actions. You can’t find the disclaimer anywhere within the sales material, because it is supposed to be hidden from you. The only way you can access it is through the small fine print found at the bottom of their sales page. Check out the original disclaimer at this link websiteterms.co/OST if you want to make sure the screenshot above is authentic. OST allows its users to trade in highly speculative investments which involve a significant risk of loss. Due to the high risk nature of trading, ‘OST’ explicitly does not make any express or implied warranties or guarantees that user will make any profit or that user will not lose any or all deposited investment funds. Using OST is far from guaranteed. in fact, it engages in extremely risky, speculative investments. Self explanatory – Contrary to what they promise in the sales materials, OST scam does not guarantee you any profit. Not only that, you will most likely end up losing ALL of your deposited investment funds. Again, OST scam admits that trading binary options is extremely risky, and it is only for investors who can stomach the loss of their entire investments. Apparently, what Optical Signal Trader revealed in the disclaimer document is totally different from what they have promised in the sales material. Always read through the terms and conditions if you find an online opportunity sounds too good to be true. There are always some hidden caveats. 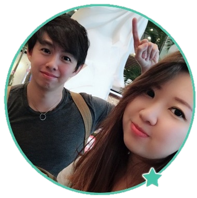 If you decide to sign up for OST app, you will be required to open a new broker account with their partner brokers, which are unregulated by monetary authorities. The losses are pocketed by the broker, which is then shared with its partner-in-crime – the scammers behind OST system. OPTICAL SIGNAL TRADER IS A SCAM. I strongly advise you to stay away from the scam if you don’t want to lose your hard-earned money. I signed up for the software and deposited $1,000, now I’m scared. I haven’t activated it how do I get my money back? Hi Noel, don’t activate auto-trading and submit a withdrawal request. You’ll most likely receive a call from account manager to stay and trade, but insist on withdrawing your funds.